Immigration rights advocates, faith leaders and elected officials came together in San Jose Friday morning to denounce the conditions of the detention centers at the Mexican border and encourage Congress to open an investigation into the U.S. Department of Homeland Security. Community members rallied at the Services, Immigrant Rights and Education Network headquarters to ask for direct action to discuss the treatment of undocumented people and the action separating parents from their children when they are detained. Many families in Santa Clara County are more worried than ever following Attorney General Jeff Sessions' announcement that children whose parents are taken into custody by border patrol would be removed from their parent's care, SIREN representatives said. 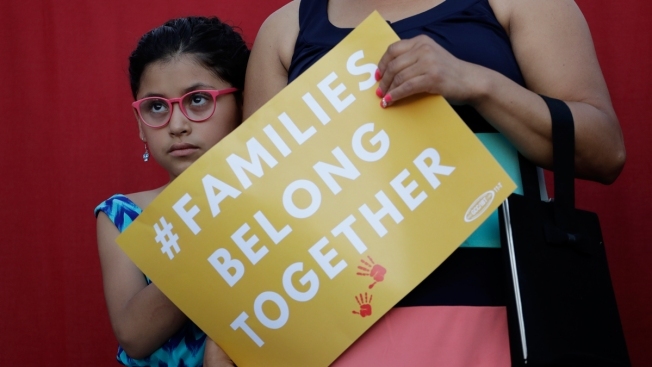 SIREN Executive Director Maricela Gutierrez said that immigrants who are just trying to seek refuge by crossing into the United States are facing serious atrocities. Gutierrez mentioned the death of Claudia Gonzalez, a young Guatemalan woman who was coming to the U.S. after earning an accounting degree in hopes of increased opportunities. The SIREN leader said that a Texas border patrol agent shot and killed her last week. Congresswoman Zoe Lofgren, a long-time advocate for immigrants in the United States, spoke on the "egregious situation" of removing children from their parents at the border. Lofgren stated that the activity goes against international law and puts this country in the same category as other regimes with similar policies. She specifically named Germany's Third Reich as an example. Lofgren, a former immigration lawyer, emphasized her distress that those seeking political asylum are not being granted that opportunity when they report to a Port of Entry. When immigrants try to go between ports to find a border patrol agent to turn themselves in, they're arrested, Lofgren said. Children as young as two or three years old are taken away and housed "who knows where," Lofgren said, and some of them may have been lost track of. Lofgren believes the separation tactic is not only inhumane but is counterproductive, as she thinks parents will continue to come back into the country to try to find their child. California Sen. Kevin de Leon was also in attendance and spoke about a news conference that took place Thursday in Sacramento to condemn the administration's actions in this regard and the "cowardly members of the Congress on the Republican side who have not raised their voice in opposition." The senator stated that even during the Bush and Reagan administrations, the nation never saw policies that allowed what de Leon called kidnapping to take place. "We believe that no federal government should ever separate mothers from their children," de Leon said. "This is a time that we need to come together and be there for each other." The gathering concluded with a call to action by one of SIREN's youth advocates, Amairani Oronia. Oronia gave a comprehensive background of what children who are taken from their parents could face, such as waiting in shelters alone for their case to be called. This process can take years, she said. The young woman urged people to speak out against U.S. Immigration and Customs Enforcement by calling members of Congress at (202) 224-3121 and urging them to demand the Trump administration end family separation and detention. Voters can speak up by exercising their right and show up to polls for representatives who stand for the immigrant community, Oronia said. "Immigrant rights are human rights," the advocate said. "We must ensure that these people are being treated and looked after to the best of our abilities."